I’d be really interested to hear ideas from coaches who have found a simple way to help kids understand why and how they should create space for a team mate in possession. Last year while coaching an under 7s team, I came up with a concept I call ‘Invisible lines’ which has had moderate success, but I can’t help feeling there is a far simpler way to articulate the idea? 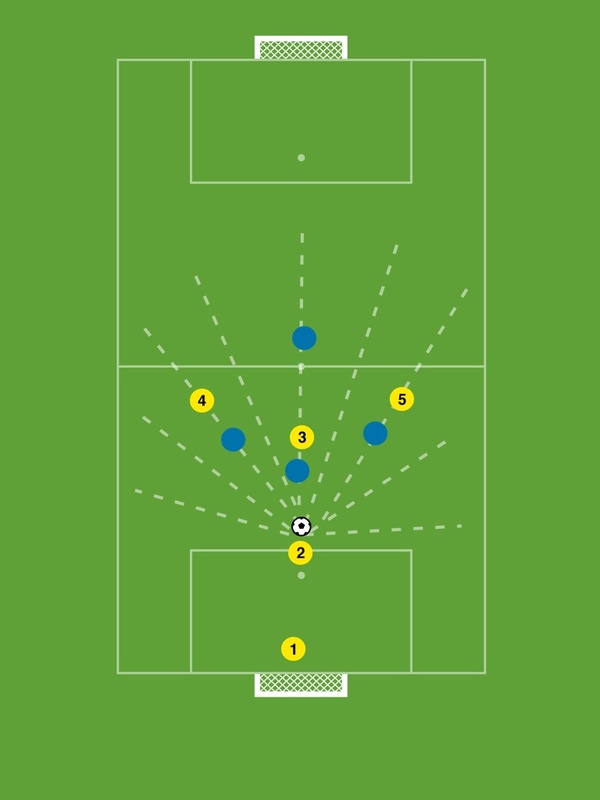 The aim of Invisible lines is to help the team in possession make space, so that their mate on the ball can pass. This is not a coaching drill as such, more something I explain and demonstrate before a keep-ball/ Rondo type drill. I ask the kids to imagine that there is an invisible line between the ball and them at all times, and that to help your mate who has the ball, its great to try and find some space that also has a clear invisible line between you and the ball. I demonstrate this concept by showing them this pitch layout on the iPad. I then develop a Q&A with the players, and ask them what pass ‘Player 2’ can make in this position? I ask what could the other players do to help Player 2 find a pass? I encourage them to show me on the iPad where players 3,4 and 5 might move to in order to make space. Finally, I set the players up in the positions on the diagram. I ask player 2 if he can make a pass, which of course he can’t, and then in turn ask players 3,4 and 5 what they could do to help in that situation. As always, I’d be very grateful if you could share your thoughts, ideas and feedback in the comments.